FORT MYERS, Fla. - Travis Blankenhorn hit his first home run of the season, but the Fort Myers Miracle dropped the series opener to the Dunedin Blue Jays, 4-1, on Monday night at Hammond Stadium. Blankenhorn's blast, a long shot to right, came with two outs and the bases empty in the seventh. The ball landed on top of the canopy that covers the back of the bleachers in right field. Scoreless in the fourth, Dunedin broke the ice with a Ryan Noda RBI single. The Blue Jays added two more runs in the fifth, on Vladimir Guerrero Jr. and Cullen Large RBI hits. Guerrero Jr., the number one prospect in baseball, is rehabbing an oblique injury he suffered during spring training. Samad Taylor extended the Blue Jays lead to 4-0 with a sixth inning RBI double. In the ninth, the Miracle loaded the bases with two outs, but Michael Helman popped to second to end the game. Making his season debut, Charlie Barnes lasted 5.1 innings. The Sumter, South Carolina native yielded four runs on six hits. He walked three and struck out six. Dating back to Saturday night, the Miracle have scored just two runs over their last 20 innings. 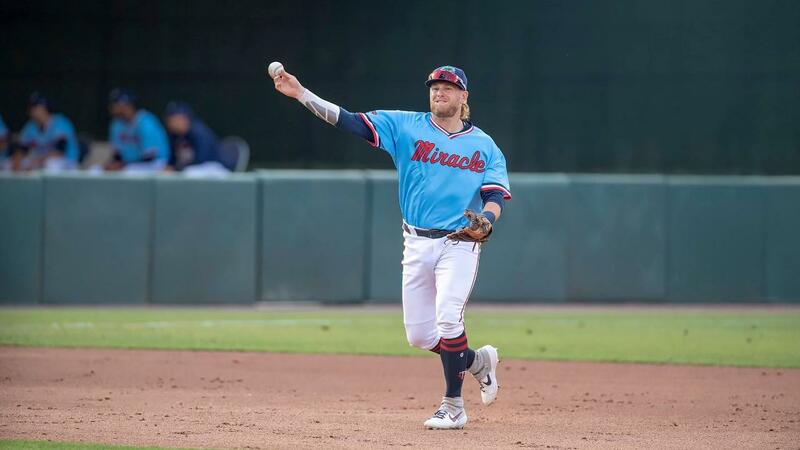 The series continues on Tuesday night in Fort Myers when the Miracle hand the ball to Randy Dobnak for his 2019 season debut. First pitch is scheduled for 6:30 p.m.